Movies always imagine hacking all wrong. If Hollywood is to be believed, hackers spend their days rollerblading, taking over traffic lights and tv broadcasts, and navigating mainframes that take the form of virtual cityscapes. In reality, hacking is much more monotonous. 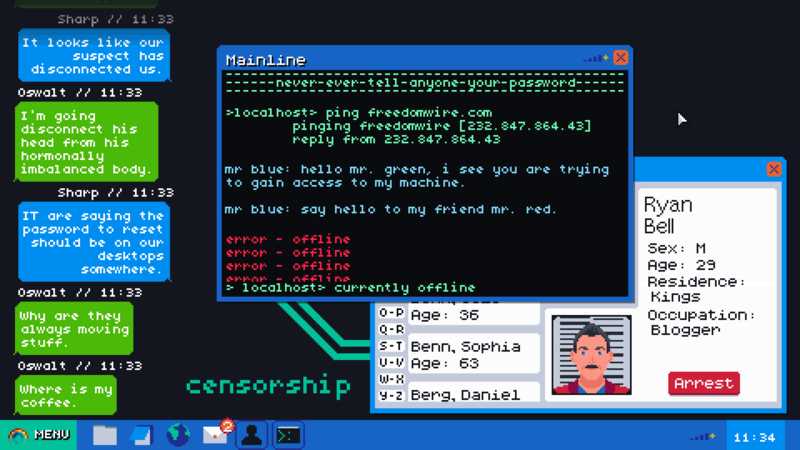 But the demo for the forthcoming game Mainlining: The Cyber Espionage Hacking Sim still manages to make it seem intriguing. In most hacking sims and films, you see the side of the hacker – this rebel fighting against the system. So I wanted to come at it from the other way – you’re in the agency, you see how they run. Overall, I guess they’re the good guys. But I wanted to really muddy that up. By the end of the game, I don’t think people will fall on a side. I guess in my mind I’d like them to take a position in the middle, but they might go either way. The demo plays like a twist on traditional point-and-click adventures. 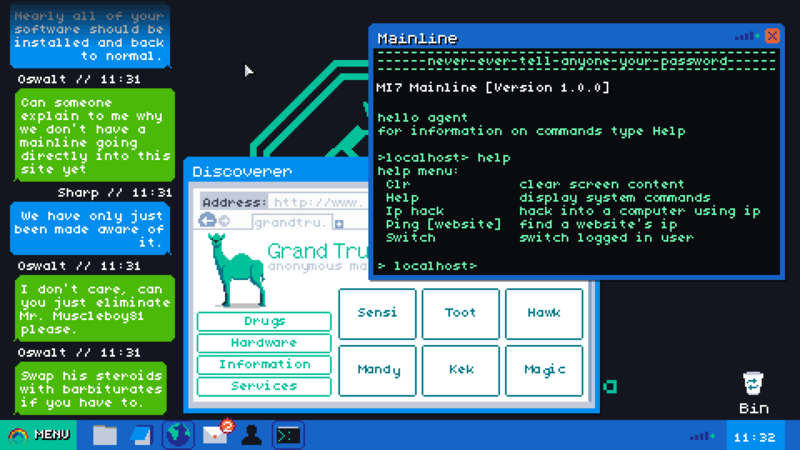 You operate an old school command prompt, looking up IP addresses and sifting through files to collect identifying evidence. You are even given a copy of Notepad so that you can jot down your case notes on your virtual desktop if you want. The game is being developed by the British outfit Rebelephant in response to the so-called “Snooper’s Charter” currently being debated in the United Kingdom as well as the American government surveillance programs unveiled by Edward Snowden. But according to Read, Mainlining has a thread of dark humor running through it in addition to an overarching narrative spread across thirteen cases. Indeed, the interoffice chat running between your colleagues reminds me a lot of the office drones in the Joss Whedon produced horror mashup Cabin in the Woods. And the detective work reminds me a lot of Sam Barlow’s Her Story. The desktop interface is reminiscent of Nina Freeman’s Cibele, Kyle Seeley’s Emily is Away, and Christine Love’s trio of interactive novels: Digital: A Love Story, Analogue: A Hate Story, and Hate Plus. With a pedigree like that and a price tag of free, you should really not let this demo pass you by.